Exterior : Pavers : Polymeric Sand • Intex Surface Solutions ltd. Eroding joint sand, weeds, and ants quickly create an eyesore on an otherwise beautiful surface. 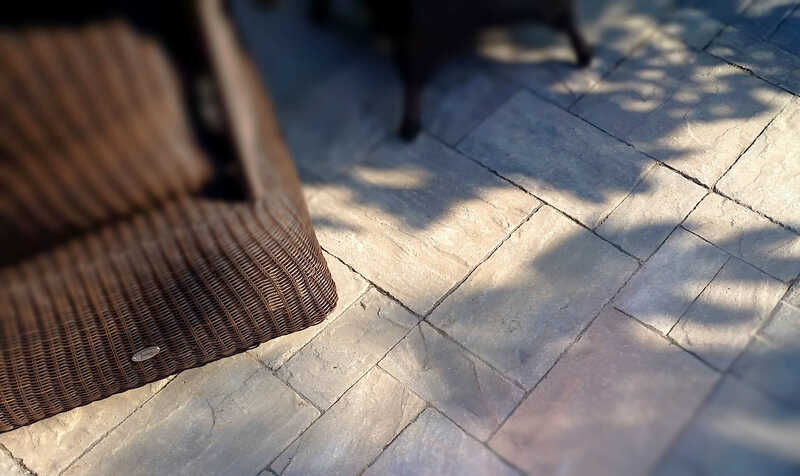 Unlike regular sand, Polymeric Sand stays in place and remains stable. When the sand is dry, it is almost as hard as concrete. When wet, the sand becomes soft, remaining within the joints while being flexible enough to follow the movements of pavers or stone. Installing Polymeric Sand begins with removing ALL the weeds and existing sand between the joints, to ensure that the Polymeric Sand thoroughly bonds for a long-lasting hold. We then compact the pavers or stone to fill the joints for a durable finish, blow-off excess sand, and wet the joints to set the Polymeric Sand firmly in place.